First Line: Car arriving now. The Catskills Shakespeare Theater Company hasn't even begun rehearsals for Much Ado About Nothing and it's already besieged with problems. The director leaves abruptly. The British actress playing the lead of Beatrice insists on naming the new director herself-- which she is allowed to do under the terms of her contract-- and her choice wants to set the play during the American Civil War. The theater company does not have the money to finance all the new sets and costumes this change would make. The one thing the new director has proven he can do brilliantly is to alienate people, so when his body is found, costume designer Charlotte Fairfax's suspect pool is quite large-- even though the death has been ruled a suicide she doesn't believe it. With so many suspects and time running out to get the production ready, Charlotte has her work cut out for her. This third Shakespeare in the Catskills mystery is another winner in Elizabeth Duncan's highly enjoyable series. 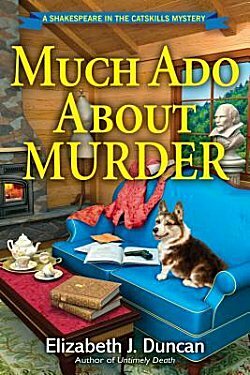 From the talented (and British) Ms. Fairfax to her corgi Rupert who jumps into bed with her the second her partner's back is turned, the author has created a strong cast of characters to solve her mysteries, and Much Ado About Murder does have a strong mystery with plenty of suspects to ponder. I do enjoy the characters and the stories, but I have to admit that another strong draw for me is the theater info which is woven into the narrative with a light, sure hand. While reading these books, I've been learning tidbits about directing, blocking scenes, costumes, budgets-- even ticket sales-- and logistics concerning a Shakespeare play being set during such an unusual time period was enlightening. Fans of cozy mysteries, colorful characters, and theater should really enjoy Duncan's Shakespeare in the Catskills series. I know I do. There's something about Shakespeare, isn't there, Cathy? There just seems to be. At any rate, this sounds like a fun read, and I'm glad you liked it. Yes, it is a fun and enlightening read.